Another Diva Entertains exclusive! 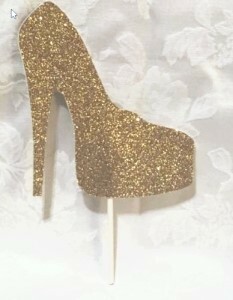 Our fabulous glitter high heel cake topper is sure to add high impact and fun to your celebration! Between the bottom of the Shoe and the bottom of the Stick is 2.5"
Please allow us up to 4 business days to fulfill your order, then add 3-5 days ship time. Thank you!